The Terios is a compact, supermini with all wheel drive. The car has a rugged looking exterior design, supermini dimensions, and can adapt to overcome various weather elements, yet remains stylish and sophisticated. Daihatsu gave the Terios a taller cabin which changed its looks dramatically over what has become the traditional supermini. As odd as it looks the car has some real quality features worth taking note of. The Terios has more cabin space than superminis of the past have had, and it provides a stable, comfortable ride. The car’s increased cabin space is more family friendly and increases the car’s potential list of buyers. The boot is now large enough to accommodate more family friendly items. The cars unique style allows it to compete more easily in its sector, its build quality rivals many of the better well known brands, and the four-wheel drive system makes it more of an all weather vehicle and that is bound to come in handy. The Terios is a supermini, but that has not hindered it’s off road capabilities much. Despite its size, the Terrios can and does function in the capacity of a 4X4 vehicle. Daihatsu’s reputation for building reliable and durable cars is exemplified with the Terios. The Terios is a very affordable car. It has a low purchase price, low running and fuel costs, and because of its uniqueness it should have a good resale value. The Terios has increased in cabin space and can comfortably accommodate four adult passengers. It also has a fairly large boot and rear seat that fold down to increase carrying capacity. The cabin is also wider and more reasonably accommodates adult passengers. The main controls and dials are large and simple. Displays are easy to read and the overall simplicity of the fascia mirrors the simplicity of the car. The functions are easily seen and functional. For its size the Terios drives and handles well. Road and engine noises are not too bad, and the seats are reasonably comfortable and supportive. Cabin noises are more apparent at higher speeds. This car is highly accessible. The doors open plenty wide enough and the seats sit high for easy sliding both into and out of the vehicle. The boot is easily accessible as well. Parking the Terios is an easy feat. The car’s small size combined with ease of steering and good all-around visibility make parking a stress-free event. The driver sits up high further facilitating the task, and parking sensors are included with the standard package. The Terios has good driver appeal. It is easy to handle and operate, steering is really nice, and the car offers several valuable safety features. The car’s off road capabilities make navigating harsher terrain a breeze and yet it is capable of delivering a smooth, inexpensive, and comfortable ride in town. The Terios could be used as a family vehicle. It offers enough seating for four and could reasonably accommodate a small family. It is durable enough to provide transportation for various family outings and has more boot space to accommodate most of the items that tend to come with family life (strollers, sports gear, etc). The cabin is also made of quality materials that could easily withstand a lot of abuse that children are sure to dish out. The Terrios would make a fantastic first car. It is small in size and inexpensive to buy and run. Insurance would be low, and driving and parking the Terios is relatively easy. The driver sits up high and all-around visibility is excellent. The 4-wheel drive feature will come in handy as a new driver attempts to navigate various weather conditions. Diahatsu has always been known for producing durable and dependable vehicles. Their use of inferior cabin materials has hurt them in the past, but they seem to be making up ground with some of their newer models that sport more high class, quality cabin materials; even if they are plastic. The Terios is eye catching but not an expensive car; therefore, thieves will probably pass it by. Nevertheless, Daihatsu has not overlooked the importance of a good security system. The car comes standard with remote central locking and an engine immobilizer. Safety standards were not overlooked either. The car comes standard with twin front and side airbags. The cars most impressive safety features include its 4-wheel drive capabilities and centre locking differential. The car is equipped with a standard stereo and CD unit, that delivers good sound quality. The car looks best in bold brighter colors such as red or blue. The cabin is comprised of mostly dark colors such as grey and black. 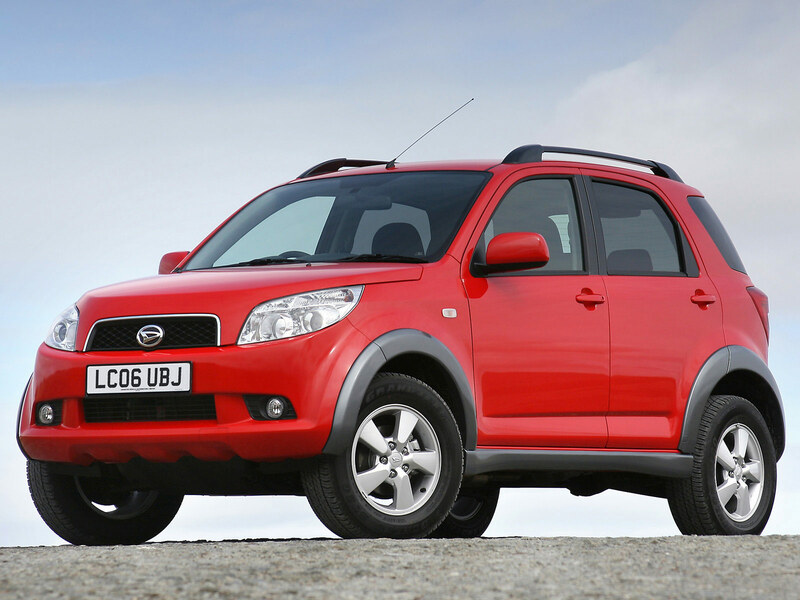 The supermini offers drivers a great driving experience whether they are chugging through the streets of town or are speeding down the motorway. It offers excellent value for the money and is likely to retain value longer than many of its competitors. The car sports a modest conservative engine so it is not likely to appeal to thrill seekers but does do an adequate job of powering the car both on and offroad.